Image caption Lord Kerslake said "our problems lie in the way that the NHS is funded and organised"
A major London hospital trust has been placed in special measures because of funding problems. NHS Improvement announced the sanction against King's College Hospital NHS Foundation Trust the day after chairman Lord Kerslake resigned criticising the "unrealistic" approach to NHS finances. The regulator said a deficit of £92m was now forecast this year - more than twice the original £38m planned for. Chief executive Ian Dalton said the position was simply "not acceptable". "The financial situation at King's has deteriorated very seriously over recent months," he said. "We understand that the wider NHS faces financial and operational challenges, and other trusts and foundation trusts have large deficits. "However, none has shown the sheer scale and pace of the deterioration at King's. "It is not acceptable for individual organisations to run up such significant deficits when the majority of the sector is working extremely hard to hit their financial plans, and in many cases have made real progress." The regulator has already appointed a new interim chairman - former private health care boss Ian Smith - to replace Lord Kerslake. He will have to work with NHS Improvement's team to carry out a review and agree a recovery plan, which will be closely monitored. The BBC understands the move comes after NHS Improvement bosses met with Lord Kerslake on Friday, when he was warned special measures would be needed given the decline in financial performance. In a statement, Lord Kerslake said of his decision to quit: "I do not do this lightly as I love King's but believe the government and regulator are unrealistic about the scale of the challenge facing the NHS and the trust. "I want to pay tribute to the staff and their excellent patient care." Image caption King's College said Lord Kerslake had led the hospital "through a challenging period"
The peer also paid tribute to the "world-class" care given at the hospital, especially after the Westminster and London Bridge terror attacks, in a self-penned Guardian article. He added: "There are undoubtedly things that I and the trust could have done better, there always are, but fundamentally our problems lie in the way that the NHS is funded and organised." 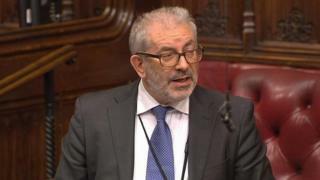 Lord Kerslake carried out a review for Labour into the Treasury last year, but has denied there was any political motivation behind his comments. Lord Kerslake's comments come after the board of NHS England said targets for waiting times could not be met next year even with the extra money allocated in the Budget. Coming from a figure with such high level Whitehall experience the latest criticism of the government's handling of the NHS carries some weight. King's College Hospital has been in long-running discussions with the regulator NHS Improvement about reducing its deficit. It's understood that it was close to being put into a financial special measures regime in which NHS Improvement staff would work alongside hospital management. Labour's shadow health secretary Jonathan Ashworth said the resignation was "embarrassing for the government". King's College Hospital described Lord Kerslake as a "passionate advocate and champion" of the trust who had a "heartfelt commitment to staff and patients". It added that he had led King's "through a challenging period which has also seen some notable successes, our response to three major incidents in London, the launch of the helipad and delivering some of the highest patient outcomes of any Trust in the UK".